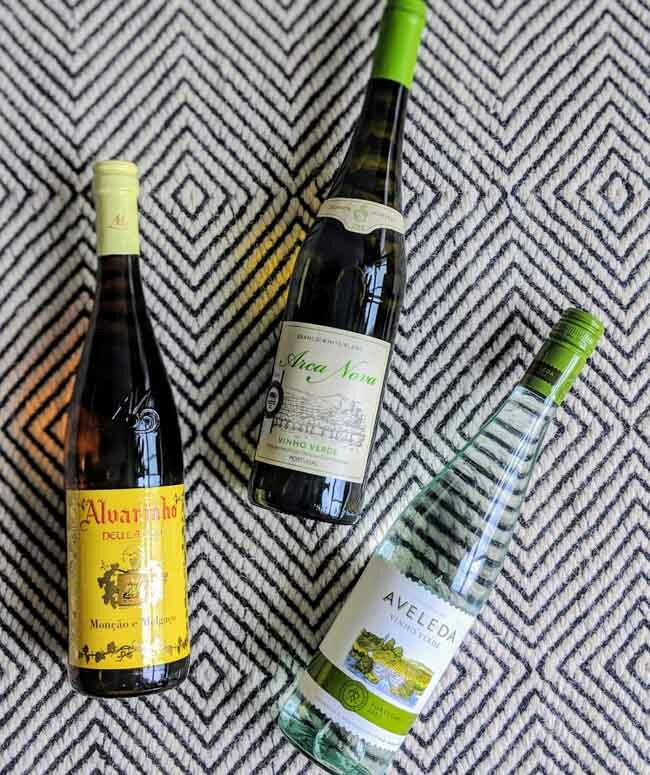 The most underrated wine you’ve never heard about, learn how to impress your snobby wine friends with an evening of Portuguese Vinho Verde wine along with the perfect food pairings. This year I’ve been traveling non-stop but I’m back in Toronto for a week to catch up with friends. This time, instead of going out for dinner I wanted to do something fun and entertain at home…well in this case entertain at Chew Street’s home. But when I have people over I don’t just break out the grocery store veggie trays and hummus. I like it to be memorable and there’s nothing better than a travel theme. – It’s budget friendly. It is one of the best values in wine. – It’s meant to be drunk young. No pressure to buy an aged wine. – It’s versatile and pairs well with fish, cheese and spicy foods. Vinho Verde is all kinds of awesome, which is exactly what I wanted to share it with my friends. 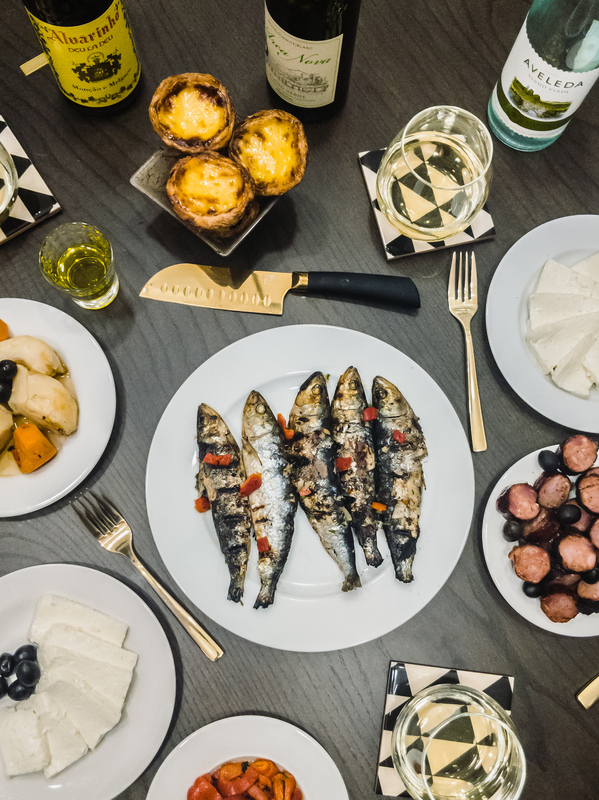 Rather than do a formal dinner, I made easy Portuguese petiscos (pronounced petishkus) – best described as Portugal’s version of Spanish tapas. Each paired well with the four bottles of Vinho Verde wine. The themed get together was a hit because everyone loved the wine but couldn’t believe they hadn’t heard much about Vinho Verde wine. If you haven’t either let me give you a primer. What Kind of Wine is Vinho Verde Wine? What Does Vinho Verde Taste Like? Where is the Vinho Verde region? First of all, let’s talk about what it isn’t. 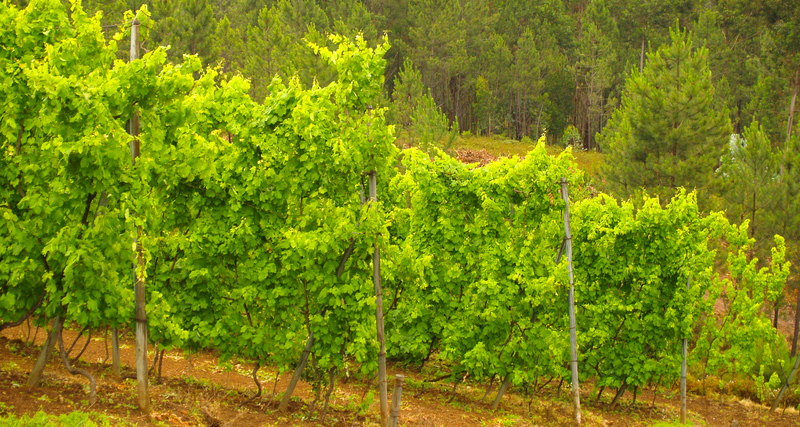 A lot of people think Vinho Verde (pronounced veeng-yo vaird) is green wine. But the name doesn’t have anything to do with its colour. It refers to it being a young wine, which is perfect as you don’t need to get hung up on which vintage (year) to buy. In this case the younger the better! While many people think Vinho Verde is a summer wine I think it’s great throughout the year. I paired the petiscos with four bottles of Vinho Verde wine to show its diversity and because Vinho Verde wine has a lower alcohol level at 8.5-11% so you can easily sample a few glasses. Many people also think it’s just a white wine, usually made from a blend of Alvarinho (the Portuguese cousin of Spain’s Albariño), Loureiro and Trajadura. However, it’s actually more diverse than that and can use up to 45 different grapes. While 90% of Vinho Verde is white, you can also find Vinho Verde rose wine made from Padeiro or Espadeiro red grapes from the southern region. As well you can find Vinho Verde red wine and single varietal Vinho Verde. Vinho Verde also has the bonus of being effervescent. It’s not quite like champagne or sparkling wine where the bubbles are created by a second fermentation. Instead today Vinho Verde wine usually gets its bubbles from a hit of carbon dioxide just before bottling. Not too bubby, it’s more like a spritz. It’s a light, clean, refreshing wine that is perfect for an easy get together. Many people often describe citrus as lemon or grapefruit. Others are more on the green apple or white peach side. If you like Sauvignon Blanc from New Zealand or Chile, Pinot Grigiot, or dry Rieslings this is a great wine to try. Vinho Verde rose tends to have a more dry berry flavour such as cherry or strawberry, similar to a Spanish rose. And Vinho Verde reds are light like a pinot noir with a bit of carbonation. Conveniently the wine is named after the region, similar to how Champagne can only be made in the French region of Champagne. 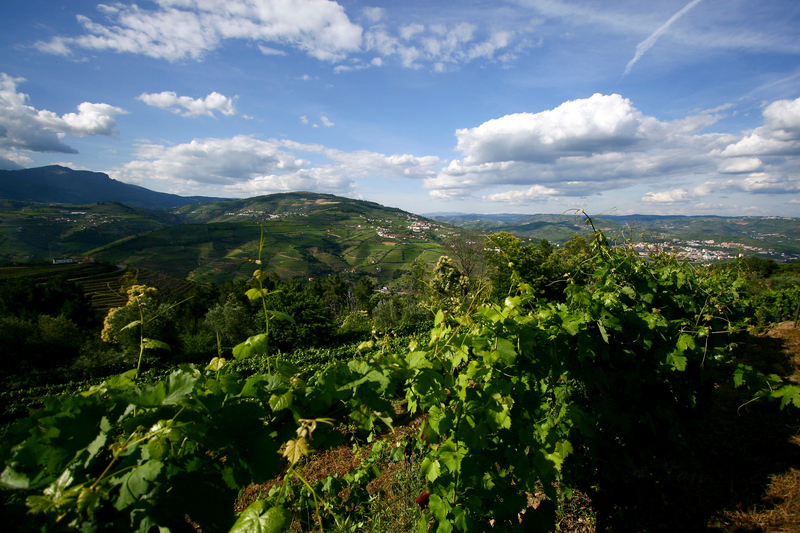 Vinho Verde is the largest wine region in Portugal. It is in the Minho province in northwest Portugal, close to the Atlantic coast. It runs from the city of Oporto to the Atlantic Ocean and the cool and rainy climate is similar to Seattle or Vancouver. When entertaining I don’t like to get stressed about the perfect pairing of food and wine. I’ve been at many expensive restaurants where the wine is supposed to be a perfect pairing and I just don’t taste it. If Vinho Verde could speak it would tell you to chill out, and just serve great food and wine. That’s because it gets along with so many troublesome foods. In general, Vinho Verde is delicious with fish, seafood, light cheeses, and can hold it’s own against spicy food. It’s even fantastic to pair with eggs Benedict for brunch. 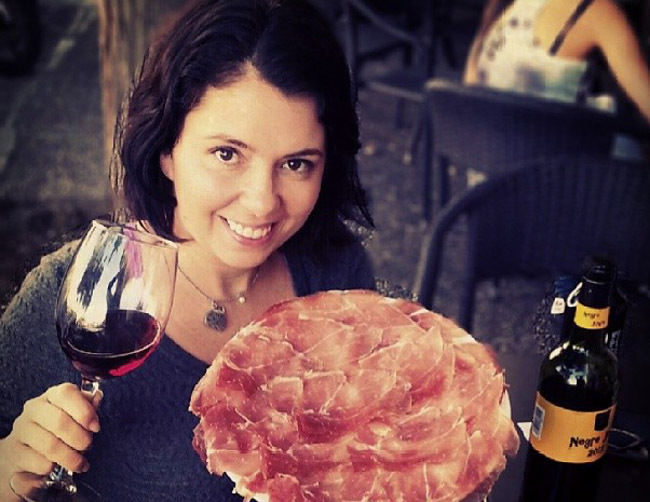 Vinho Verde wine and petiscos are the perfect pairing. Both are unpretentious, approachable and more about focusing on the people you’re with. As I was entertaining on a classic Portuguese theme, and the vineyards are often close to the Atlantic ocean I chose fish with a bit of pork…because I can’t host friends for food without having pork! White Vinho Verde: Grilled chouriça & morcela. 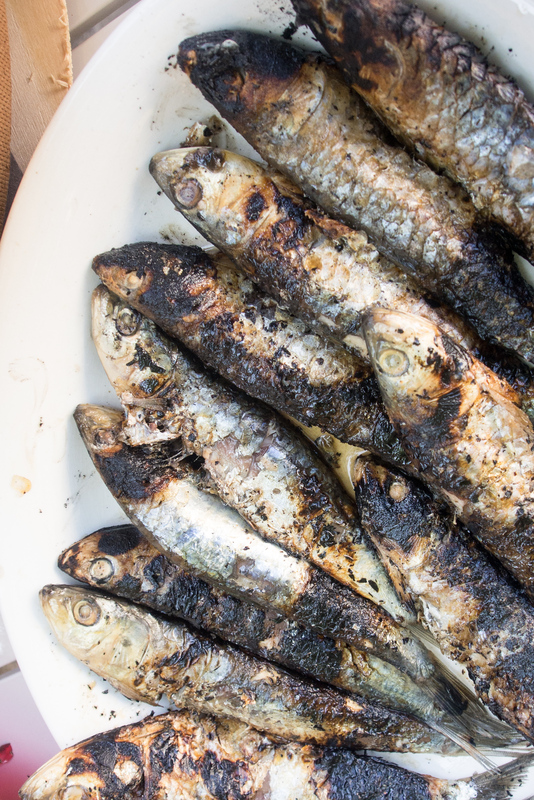 Red Vinho Verde: Grilled sardines. I know you’re thinking that the classic pairing for fish is white wine. 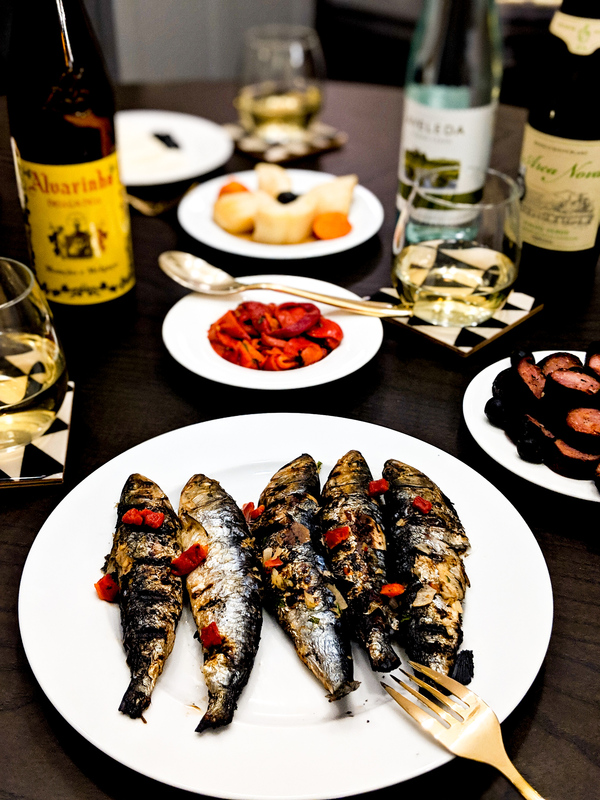 But Red Vinho Verde is common with sardines in Portugal as the red compliments the charred flavours. The acidity of Vinho Verde is a great pairing for pickles, light cheeses and Portuguese egg tarts. In 1908, the Vinho Verde region was granted permission to award a classification to its wine to assure its quality – again similar to Champagne, only quality sparkling wine from the French region can be classified as Champagne. The good news is that for a wine to claim it is Vinho Verde it is not only from the region but its quality must be approved. Disclosure: This post about Vinho Verde wine and food pairings is in partnership with Vinho Verde wines. As always all opinions are my own, and I love that I have the opportunity to work on great programs like this. That’s so cool, I love Vinho Verde but I assumed it was always white. Great info and pairing ideas, I am definitely no on the hunt for some red and rose Vinho Verde! Thanks and cheers! Not your fault at all, a lot of the exported wine is white but if you’re lucky you can find the rose or red. I had the chance to try many Vinho Verde while in Portugal and I loved them! Thanks so much for sharing the article and great pairing information – I will definitely be looking for some. I am so jealous of that Denise, I still haven’t been to Portugal.